Your choice of all natural Dunlop latex or Blended Talalay latex! No cheap poly-urethane edges as found in national brands. Show us a better deal and we'll beat it. When you're looking for an outstanding latex mattress, Mattresses.net delivers. As the online presence for the Arizona Premium Mattress Company, we offer the quality you insist on at prices you won't believe. Our solid core latex foam mattresses contain your choice of 6" of all natural Dunlop latex or blended Talalay latex! You won't find cheap poly-urethane edges as found in national brands in our products. Show us a better deal and we'll beat it. This style of latex mattress-core offers variable support and is available in our exclusive half n' half style. Left side may be soft 28 ILD, right side may be medium 32 ILD or firm 36 ILD, etc. (at no extra charge). 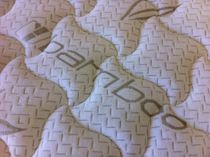 In this latex mattress we offer a 6" full latex core, beautiful bamboo quilted stretch knit fabric, with 1.5" of Pure Joma Wool quilt on each side to reduce impressions. Our Talalay Latex mattresses feature a 60/40 blend of synthetic/natural latex. If you choose All Natural Dunlop it will feel a little firmer than the Blended Talalay does. Dunlop is better suited for back sleepers and heavier people. Our products come with a 20-year limited warranty, 10-year non-prorated, 10-year prorated. We all deliver all of our latex mattress models with a 60-day satisfaction guarantee less shipping costs. Remote areas may require additional shipping fees. Shipped compressed and rolled for UPS delivery. Warning! This item is very heavy and is NOT recommended for out of state orders due to the difficulties involved if a comfort exchange is necessary. We strongly recommend our Adjustable Ultra Plush Latex Mattress instead. The comfort level is the same but much easier to assemble and exchange if necessary. Arizona Premium Mattress Co. features the Talalay process: a highly controlled, sophisticated latex manufacturing process that produces the highest quality, most consistent latex available in the world. An alternative technology, known as the Dunlop process, is the most commonly used production method globally. It creates a firmer product that is most often used as a base core component. The major difference between the two processes is what happens in the mold just prior to the initial latex curing stage. In the Talalay process, only a small amount of latex compound is poured into the mold. Air is extracted to perfectly distribute the foamed liquid inside the mold and to create a consistent round, open cell structure. The latex mattress core is flash frozen to lock the cell structure in place and to prevent the particles from settling. In the Dunlop process, the molds are filled to the rim, air is not extracted, and there is no freeze stage. Therefore, the latex cell structure is less "airy." Gravity takes over settling the particles to create a denser product than Talalay latex. Talalay latex beds are available in a much wider firmness range so it can provide enhanced comfort choice for consumers around the globe. If you're ready to enjoy a great night's sleep, our foam mattresses deliver comfort. Whether you are looking for king mattresses or a new foam mattress topper, we're here to serve you with the very best bedding for less. Just order online or call us directly at 1-888-77DREAM for the best mattresses in the business at the best prices. Ask about our new 100% natural Talalay upgrade!